DEALS: 3DR Solo with Gimbal just $599 for Father’s Day! Here’s a very special drone deal: Normally $999, the 3DR Solo with 3-axis Gimbal is just $599 through Father’s Day! The 3DR Solo was the drone that innovated several autopilot features such as the famous “Orbit” mode (the drone rotates around a chosen point of interest — inside joke for drone users ^_^ ). 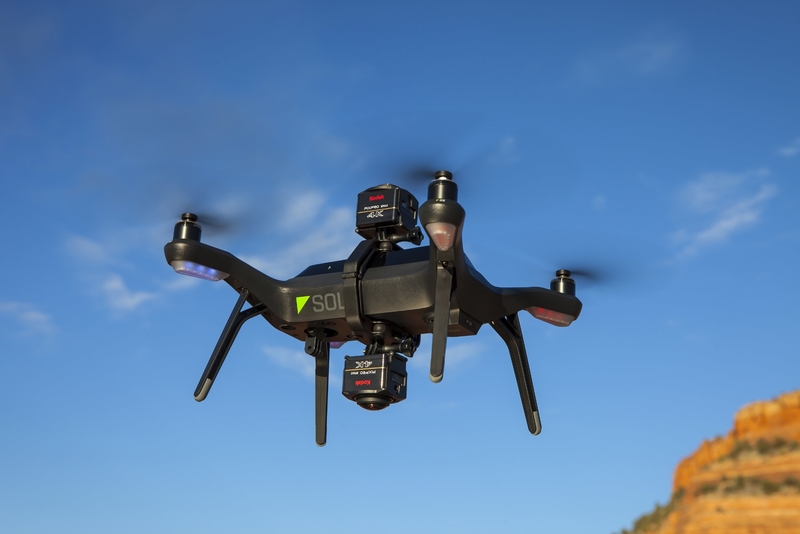 Of particular interest to readers of 360Rumors, 3DR has teamed up with Kodak Pixpro to create a special dual mount bracket that lets you use the Kodak SP360 4k to capture aerial 360 videos effortlessly (pictured above), with no drone visible in the shot! See HERE for more info. Please note that the 3DR Solo does not have its own camera. Instead it uses a GoPro camera (which you buy separately) and has electronics to allow live view with the GoPro. But if you plan to use the 3DR Solo with the SP360, you won’t need to add a GoPro camera. Note also that the $599 bundle here does not include the SP360 4k or dual brackets either. The Aerial Pack (which includes the special bracket and a pair of SP360 4k cameras is $999; or just $169 for the bracket by itself). *It MIGHT be possible to use a GoPro 1/4-20 adapter to use another 360-degree camera instead of the SP360 4k. But we don’t know for sure until we try the dual bracket. The special deal is available on Amazon and B&H. I prefer to buy from Amazon because I got dinged by B&H when returning a drone I got from them even though the drone was defective (according to their own tech personnel). If you would like to buy from Amazon, please consider using the link below, which would be an awesome way to support the blog at zero cost to you!